Concerns about enough room for parking have temporarily sidelined a mixed-use project that would be a neighbor of the Design District. 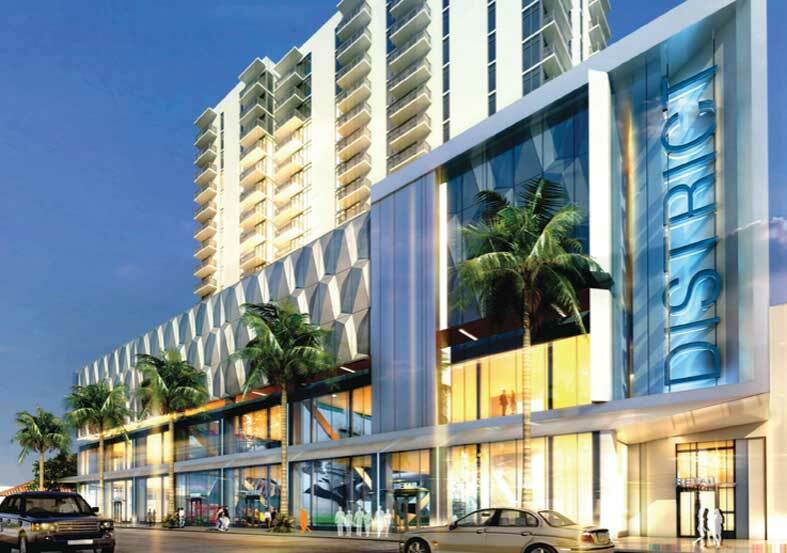 The project was deferred in December for one month by Miami’s Urban Development Review Board, which directed Mack to explore options to increase parking and look at other materials for the façade on the parking levels. Iris Escarra, an attorney representing Mack, said District 36 will be 19 stories, have about 197 rental apartments, 66,741 square feet of retail uses, and provide 422 parking spaces. The developer was asking to reduce required parking by up to 10%. Other requested waivers included allowing one industrial-size loading berth instead of two commercial-size loading berths, and to allow parking above the second story. Ms. Escarra emphasized the project’s important location, on the northern end of Midtown just south of I-195 and the Design District, and close to Wynwood. “It really is a connect project,” she told the board. A presentation by Architect Jonathan Cardello of design firm ADD Inc., now with Stantec, showed renderings of the L-shaped building, to be positioned on the site in an effort to keep most of the square footage back away from the noisy highway. “We worked hard to make that expression,” he said, pointing out the two stories of retail space, which includes an entire second floor of retail. The design would allow a larger user to take one or two floors of the retail, he said. The south elevation will have a continuous expression of retail uses, which then wrap around the corner of Northeast 36th Street and First Avenue, said Mr. Cardello. The design of the parking area segregates retail customers from those living in the dwelling units, he said. The parking, he said, will be screened with perforated metal panels, designed for airflow capacity. Atop the garage, facing First Avenue, would be a roof deck with large outdoor terraces, a swimming pool, cabanas, whirlpool, a dining area and restrooms. Mr. Cardello acknowledged that an existing daycare adjacent to the new building will remain. Board member Neil Hall wondered why the daycare wasn’t shown in the renderings. “It would have been nice to see it,” in relationship to the “huge” building planned next to it, he said. Mr. Hall said he was familiar with the property, and its nearness to the elevated lanes of I-195 and how the space under the highway is often used for parking. Mr. Cardello said District 36 is a “critical” project linking Midtown to the Design District. Growing popularity of the Design District became part of the discussion. Mr. Hall said the growing Design District is about to “blow up” and area parking will be gobbled up by people headed to the district. Ms. Escarra noted that developers of the Design District are building their own parking structures. True, said Mr. Hall, but the high-end stores and other attractions rising in the Design District will “bring hordes and hordes of people” to the area, creating a big demand for places to park. Mr. Cardello said the design of District 36 takes into account its central location, where multiple interesting destinations can be reached on foot. The project encourages walking, he said. Board member Anthony Tzamtzis also expressed concern about parking at the development. And Mr. Tzamtzis isn’t a fan of the design on the structure’s northern end that will face I-195. “I feel the north elevation could have been done better,” he said. “It needs something more exciting, more dynamic.” He said using metal lattice for balcony railings was a poor choice. “Explore other materials,” said Mr. Tzamtzis. Chairman Robert Behar agreed with fellow board members and said he couldn’t agree to reduced parking for the project. Ms. Escarra said the developer feels there would be ample parking for the project, which is to include 127 one-bedroom units, 67 two-bedroom units and three three-bedroom units. The request is to allow a reduction from 468 parking spaces to 422, she said. Mr. Behar said a restaurant taking some of the retail-commercial space could trigger more demand for parking. Mr. Cardello agreed, but said a furniture store would require less. Mr. Behar complained there wasn’t enough emphasis on the garage screening material and that mechanical lifts would be inconvenient. Ms. Escarra said the developer and designer would study options to have more parking and address concerns about the plainness of the screening material on the parking levels. Forget parking. TRANSIT! No true metropolitan city has a parking space for every person that’s living or visiting it. Adding car parks to each building KILLS pedestrian traffic and commercial space. Folks living downtown will have to learn to live without a car. Just like New York, Tokyo, and Hong Kong. A well-rounded downtown Miami makes it almost unnecessary to own a car. TRANSIT IS THE ANSWER. No one who owns a condo in Manhattan has any realistic expectation that they’re getting a parking spot for their [useless] automobile with that condo purchase. The broad should be promoting less parking but they’re doing the exact opposite. Even these developers see that Miami needs smaller parking garages. All these people advocating against parking and in favor of transit as if this was a zero-sum game are delusional. Miami is not Hong Kong, Tokyo or New York. It will not be for the next 50 or 100 years. Miami needs adequate parking and mass transit, both of them. A metro area with such a vast suburban sprawl cannot live without adequate parking AND mass transit. @Jaime- I hear talk like this all the time. Usually from people who live out in the suburbs and want the city proper to provide *them* with the same level of wasteful services/facilities they’re accustomed to for their semi-annual trip to a Heat game or the beach. Park your car at a station and get on a train. Miami isn’t Fort Apache the Bronx.